Lillian Mbabazi performs at the Open Mic Festival at Acholi Inn Gardens on Saturday. Photo by Irene Abalo. Lilian Mbabazi, the legendary Blu*3 song bird, last Saturday got all revelers at the Open Mic Festival at Acholi Inn gardens off their feet as they danced to a variety of her hits, including some of the Blu*3 hits and Coke Studio mixes she performed with other artistes in 2013. Among the revelers included children and Mbabazi was chosen because of her decent dressing and language. Dressed in a short black dress with matching black boots, Mbabazi stormed the stage at midnight amid applause from revelers who parted with Shs30,000 each to watch the talented female artiste. While on stage, she blended with the audience with her contagious musical laughter in the microphone as she greeted and built rapport with a crowd that in turn showered her with love. The family friendly show had children with their parents and the youth who ate Yo kuku chicken and bought all the ice cream from Wawoto Kacel Corporative Society, apparently the best Ice Cream makers in town. The Rolex makers were busy till 2am when they run out of supply. But there was plenty to eat and drink as Castle lager was sold a bucket of five at only Shs10,000. Fun City set up their play center near the swimming pool as parents were busy meeting and greeting at the gardens. By the time Mbabazi came on stage, the crowd was more of adults. It was mid night. The moment she had the microphone, her live performance, mesmerized many in the audience with her rich and powerful vocals. With her band the Sundowners, Lillian sampled her original compositions. “Vitamin, commonly known as, I’m in danger,” “So in love,” which she dedicated to all those in love as she sang along with the crowd, “dagala”, and “Kawa” that reminded revelers of her coke studio days. Mbabazi’s passion for live performances spread through the crowd as her voice rung in the air to tunes from some of her favorite Blu*3 songs like Nsanyuka Naawe, that had the crowd singing along.The group split in 2010 to focus on solo careers. The talented artist has since then gained ground as one of Uganda’s best female artist because of her rich, soulful, and powerful vocals. Mbabazi participated in Coke Studio Africa 2013 performing a remixed and up tempo version of her hit ‘Danger (Love letter)’, a remix of ‘Maria Salome’ with Temi Dollface (Nigeria) and a taarab song ‘Bahati’ with Culture Musical Club (Zanzibar). She has a back catalogue of songs that have been very successful in East Africa. She has already done collaborations with some of East Africa’s top artistes including Navio, Radio & Weasel, AY, P-Unit, Kitoko, The Mith, Keko, Cindy, Ekky & DJ Global. 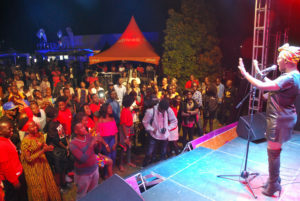 Other artistes who rocked at the Open Mic Festival include Charles Olara, the Saxophonist, Jackie Akello who performed her hit songs, “Amari” and “Samanya”, standup comedian Agnes Akite and Kenneth Mugabi, the Afrosoulfull Musician. His song “Naki” sent the crowd wriggling in sensational moves as he played the guitar. When Akite who brags of being a married woman whose husband has never seen the legs jumped on stage, the crowd went mute then burst into laughter as she continued to introduce herself setting pace with how Luo others rebuke their children in the name of showing love. “Is this the Akite? She looks young.” Said a reveler who expected a huge dark skinned woman, a depiction of a truly built Luo woman. Paul Mutanga, the MC and CEO O Entertainment, the brain behind the Open Mic Festival described Akite as a half cast with Lango and Acholi genes. “I am a Luo. I don’t know about the rest, all I know is that I am older than you think. Don’t look at my short hair and think I am young, I am not.” Said Akite as she teased the crowd about her appearance in a black overcoat on a black vest with Kitengi shorts. “I am a graduate from Makerere University but I don’t remember the last time I bought a dress for myself. This outfit was just given to me to showcase to you today but you people, parents can no longer afford clothes in Uganda.” Says the comedian. Her ribe cracking comedy got some people laughing with tears. Sandra Adokorach could not help but hold her stomach after laughing for about ten minutes. “This woman just knows everything about how African parents discipline their children and how we pretend that certain things in society are okay yet they hurt us, she is amazing because she knows the Luo culture and her comedy is relevant to us parents. We have to change.” Adokorach told our reporter after Akite’s 30 minutes performance that hit mostly parents and service providers. 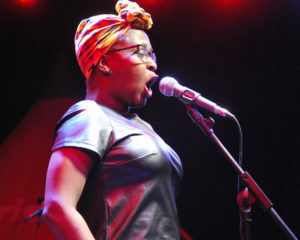 Mbabazi woos the crowd during her 45-minute performance. Photo by Irene Abalo. Grace Labongo 58 years old and the head teacher of Kirombe Primary School attended the festival with her 43 year old friend Judith Omona who works with Jambo Gardens in Cereleno. “I like supporting Acholi events that bring people together and make us happy. We have been in sorrow for too long and this makes us relax and enjoy life as we reflect on our African talents.” Says Labongo. Omona could not hide her excitement as she enjoyed every moment of the show. “I was ambushed to come here. I wasn’t dressed up for anything. But when I came here, it was African attire. I am really happy to see women dressed in Kitengi. I like what I see here, the men too are enjoying their African wear as you can see in that guy over there.” Omona said while pointing with her tongue at a gentleman in a company of three ladies. Open Mic festival is a get together fun filled entertainment with African themes to unite the Luo and reflect on their existence with others in the society. Paul Mutanga, the CEO of O Entertainment that organized the festival says the event continues indoor, twice a month at O Café in Gulu town as they plan for a series of such an event in the future.